CUT, CLEAR, AND MULCH UNWANTED BRUSH, THICKETS, GRASS AND SAPLINGS UP TO 3". 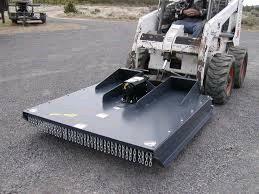 BUSH HOG STYLE MOWER ATTACHMENT FOR BOBCAT SKID STEER OR TRACK LOADERS. 65" MOWER DECK CUTS 60"
* Please call us for any questions on our mower 60 inch hyd. attach. bobcat full size rentals in Portland OR, Gresham OR, Milwaukee OR, and surrounding metro area.